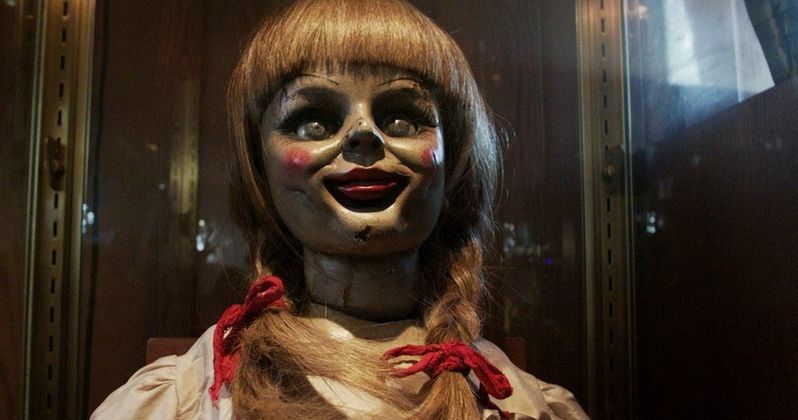 GIVEAWAY: Win Scary Annabelle Prizes! She terrified you in The Conjuring! Now, Annabelle is back and she's ready for revenge! We're celebrating the return of everyone's favorite doll with a new giveaway just in time for Halloween! Fall is in the air, and so are the screams of a horrified audience as they revisit this classic character, who has been locked away in an occult museum in Connecticut, blessed by a priest who visits her twice a month. Based on a true story, Annabelle recounts how the doll came to be possessed and what led her on a shocking journey that has captivated and mystified even the most strident non-believes. With the movie arriving in theaters just in time for Halloween, we're giving away some very scary items, including an Annabelle paper mask for all your upcoming trick or treat escapades, as well as a deck of 'glow in the dark' playing cards that may be posed by the devil himself! We also have a branded cinch bag, a heat changing mug for those chilly fall nights, a T-shirt, and a truly scary sleep mask that will give you nightmares! Continue reading for how you can enter this giveaway, and win today! She terrified you in The Conjuring, but this is where it all began for Annabelle. Capable of unspeakable evil, the actual doll exists locked up in an occult museum in Connecticut-visited only by a priest who blesses her twice a month. New Line Cinema's supernatural thriller Annabelle begins before the evil was unleashed. John Form has found the perfect gift for his expectant wife, Mia-a beautiful, rare vintage doll in a pure white wedding dress. But Mia's delight with Annabelle doesn't last long. On one horrific night, their home is invaded by members of a satanic cult, who violently attack the couple. Spilled blood and terror are not all they leave behind. The cultists have conjured an entity so malevolent that nothing they did will compare to the sinister conduit to the damned that is now...Annabelle!